Grease a large ceramic or glass bowl with butter. In a small saucepan, scald the milk over medium-high heat. Stir in the butter and cool. In a small bowl, combine the yeast, 1 tbsp of the sugar and 2 tbsp lukewarm water, and set aside to bloom for 10 minutes. In the bowl of a stand mixer fitted with the paddle attachment, beat the remaining sugar with the salt and the milk mixture on medium-low speed until incorporated, 1 minute. Add 2 cups of the flour and beat for 1 to 2 minutes more. Add the yeast mixture and beat for 1 minute more. Add the eggs one at a time, beating after each addition until incorporated. Stop the mixer and switch to the hook attachment. Add the remaining 3 cups flour and knead on medium-high speed until the dough forms a smooth ball, 8 to 10 minutes (you can also knead by hand on a clean work surface). Transfer the dough to the prepared bowl, cover with plastic wrap followed by a clean kitchen towel, and place in a warm spot to rise for about 2 hours. Butter three 9 inch round cake pans. Whisk the sugars and zest in a small bowl. After the dough has risen, place it on a lightly floured work surface and knead a few times with floured hands until the dough is no longer sticky. Divide it into three equal pieces. Using a rolling pin, roll out one piece into a thin 12 inch circle on a lightly floured work surface. Spread one third of the softened butter evenly on top of the dough, followed by one third each of the orange sugar mixture. Roll the dough over the filling into a tube and cut it into six equal sized pieces. Place the pieces cut side up in the prepared pan and set aside to rise again, covered loosely with plastic wrap or a clean kitchen towel, for 1 hour until almost doubled in size. Repeat with the remaining dough and filling. Before baking, heat oven to 350 degrees. Bake the rolls until golden brown, 20 minutes. Cool slightly before icing. In the bowl of a stand mixer with the paddle attachment, beat the butter, sugar, vanilla and milk on low speed until just combined. Then increase the speed to medium and beat until smooth, 1 minute. Spread the icing evenly over the warm buns. 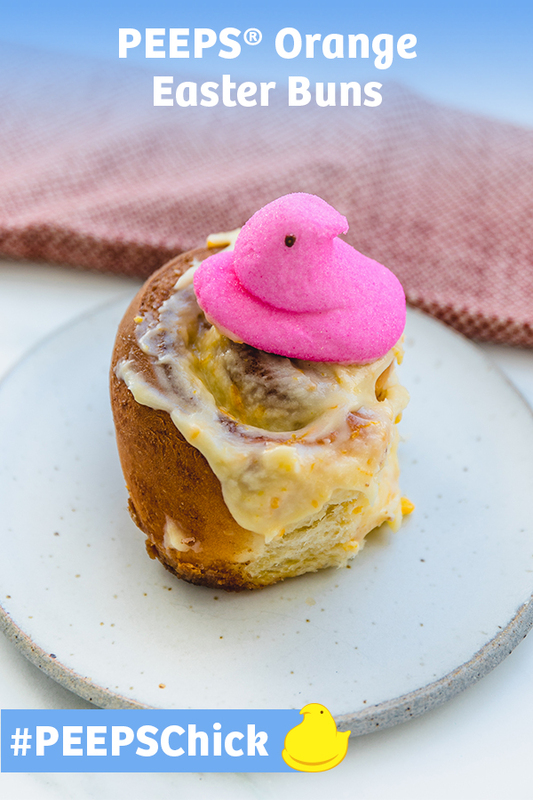 Nestle PEEPS Marshmallow Chicks into the nooks and crannies of your orange Easter buns.